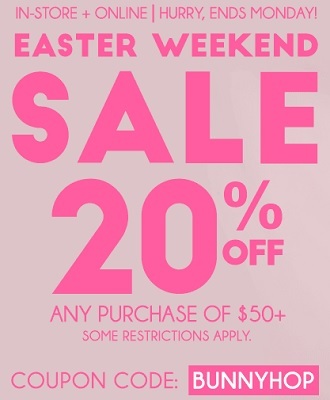 Shop during Ardene Easter Weekend Sale and receive discount on your entire purchase. It is very easy. The only thing you have to do is to spend $50 or more, then you can take 20% off your entire purchase. To receive the offer online use promo code BUNNYHOP at checkout. Some exclusions may apply. Plus, take an advantage of free shipping on orders of $50 or more. Official source of the information is Ardene Canada. Offer is valid through March 28, 2016. For more information about the promotion visit your nearest Ardene Canada location or Ardene Canada online.